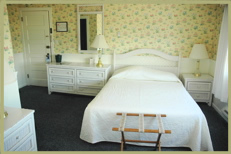 Guest rooms at the Windermere Hotel are beautifully appointed and many provide spectacular views of Lake Huron and the Mackinac Island harbor. Our twenty-six rooms each include a private bath. There are no televisions or telephones in the rooms. You are responsible for all rooms reserved and confirmed for dates requested. Please read your confirmation letter! It is very important! We provide porter service from the dock to the hotel. A suggested gratuity is a minimum $2.00 per bag. Ask for the Windermere Hotel porter when you get off the ferry. When you checkout, If you would like to have your luggage pre-shipped, please leave a tip at the front desk for the porter. The hotel is equipped with an automatic fire and sprinkler system for your safety. We offer group rates and we welcome tours! Windermere Hotel Gift Certificates make wonderful gifts for the holidays or anytime! Stay in touch via Facebook to learn about specials. Mention specific Facebook or ad specials when you call to get these great rates! Discounts are calculated at the time of booking. No charge for children under 16 years of age. Please add $30.00 per person, per day, if there will be over two persons in the room. Baby cribs provided at no extra charge. Rollaways are available for $30.00. Michigan sales tax applies plus a 2% hotel assessment. To confirm a reservation, we request a one-night deposit on each room. The deposit is required at the time the reservation is made. Deposits are charged in advance. You are responsible for all rooms reserved and confirmed for dates requested. Please read your confirmation letter! It is very important! We provide storage for luggage or late departures. If you would like to have your luggage pre-shipped, please leave a tip at the front desk for the porter. Deposits are refundable only if your room is cancelled at least two weeks prior to your scheduled arrival date. All refunds are subject to a $30.00 handling charge for cancellation. Guests are responsible for their entire confirmed reservation dates in the event of no shows, late arrivals or early departures. 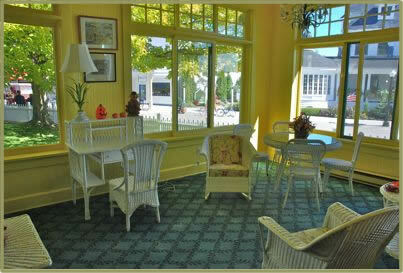 We serve coffee, juice, and donuts to our guests in our sitting rooms daily from 7:00 a.m. – 10:00 a.m.